Negotiate for a raise or promotion with this low salary complaint letter in the workplace. 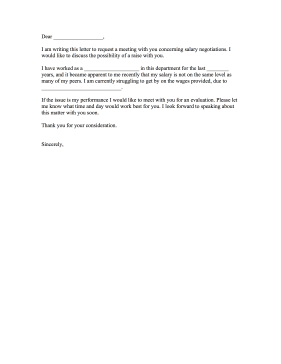 I am writing this letter to request a meeting with you concerning salary negotiations. I would like to discuss the possibility of a raise with you. I have worked as a ____________________ in this department for the last ________ years, and it became apparent to me recently that my salary is not on the same level as many of my peers. I am currently struggling to get by on the wages provided, due to _____________________________. If the issue is my performance I would like to meet with you for an evaluation. Please let me know what time and day would work best for you. I look forward to speaking about this matter with you soon.